Favorite company outing: Houston Food Bank. In four hours, we packed 2,000 food packages for families in need — an amazing feeling! • Three-year dual system work-study program at Hagen Kaffee, a leading specialty roaster in Germany, graduating with a business degree in Wholesale and Foreign Trade. • SCAE German Cup Tasting Champion, 2008. • One-year traineeship followed by two years as Quality Manager at Sertinsa, the NKG (Neumann Kaffee Gruppe) export operation in Guatemala City. • Three years as Trader/Green Buyer in charge of Central and South America, at import company Bernhard Rothfos GmbH in Hamburg, the largest operative company of NKG. • Two years as CEO of Sertinsa, NKG export operation in Guatemala. 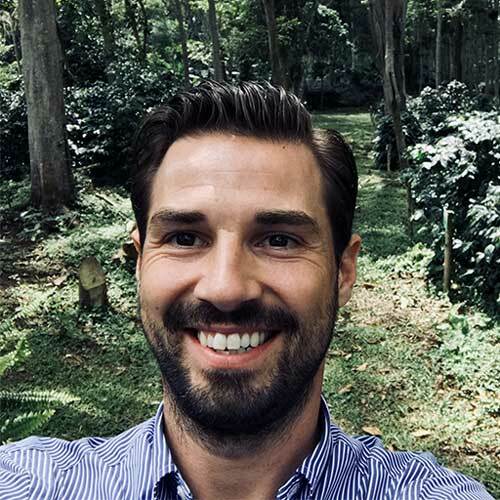 Since joining InterAmerican in March 2017, Florian has embraced the challenges of his new role as CEO, forever grateful for the experiences and opportunities that coffee has offered him and thankful every day for that first morning cup. Random fact: I eat pho 2 to 3 times a week. Best coffee memory: There are so many, but one of the most significant was winning the German Cup Tasting Championship in 2008. It was totally unexpected and formed the point of no return for me in coffee.